Nearly two years ago I wrote an article for the August 1998 issue. In that article I tried to tell some of the good and some of the bad about my EV. 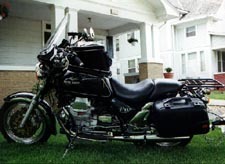 After having owned this Guzzi for two years, I'm going to give a general rundown now that it has 36,000 miles on the clock. The EV was purchased in May 1998. After picking it up at Harper's Moto Guzzi, the return trip took five hours so I arrived late in the evening. 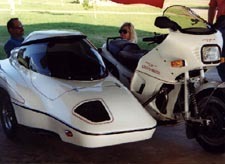 I rolled the EV off the trailer and, after showing it off to my wife Mary Jo and to my close friend Chuck Oborny, I left it alone until the next morning. I was up early the next day and quickly installed the fairing, bags, trailer lights connections, etc. 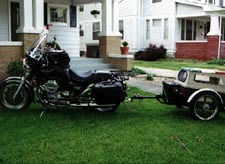 I put less than two miles on it (going to the gas station) and then attached the trailer, and off we went heading for the 1998 Louisiana Rally. After returning home I quickly replaced the stock seat by sending the original one off to Rich Maund. Rich did an exceptional job restructuring and reupholstering the seat. I have sat in that saddle up to 16 hours at a time and I can honestly say that my bottom-side didn't hurt. Actually, I felt I could have gone on for some time. Originally I put a National Cycle Plexi III fairing on the EV and loved it, but after hearing good things about the Swanee Aero Foil fairing I became interested in it. I liked the fact the Swanee wasn't totally clear and a lot of the surface was black finish. Also, I could replace the clear windshield. I haven't ridden behind every fairing known to man, but I've experienced a lot of handlebar touring fairings and frame mounted touring fairings. The Swanee "Aero Foil" is the pick of the litter. In my first article I whined about the "toy" luggage rack. The California models are supposed to be for touring; in fact all of the California models do a grand job running hard down the highway. And it isn't only Guzzi that supplies a lousy luggage rack with its touring models. Go to any motorcycle dealer's showroom and you'll see tiny little racks on the back, racks more suitable for a lunch-box. I did away with the "toy" rack (this ain't no cruiser!) by removing the luggage rack from my 125cc Vespa! (I love my little Vespa too!) 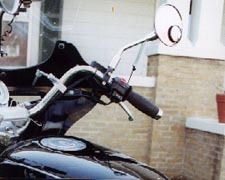 The bottom line, I had a local welder mate the Vespa rack to the Guzzi rack. Presto! Below, you see a "REAL" luggage rack. 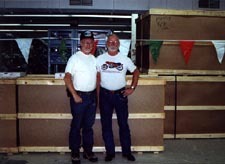 I was about to send the rack to a chromer when I found out my friend Steve Ford (Parts-Is-Parts, see his ads in the newsletters) was starting up a power coating business. I sent the rack to Steve and he turned it into a "REAL" shiny black luggage carrier. The finish on the rack is tough! I've hauled a lot of stuff back there and used bungee cords without the plastic covering on the metal hooks. As I said, the finish that Steve put on there is tough! It has surpassed my expectations. 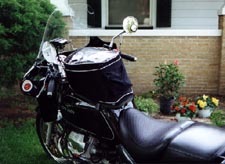 After using a couple Harro 40 liter tank bags for 20 years, I saw an amazing tank bag at the Iowa Guzzi rally last year. Here again, for me and mine, bigger is better. I can't tell you the name of the bag, only that it used to be sold by Moto Guzzi North America. I spoke to an Italian friend while he and his wife were touring the United States on their G5. He had almost the same bag on his Guzzi and he said it was Italian made. So I was even happier to find out this new bag wasn't only a great (user friendly) tank bag, but also that it was made in Italy! 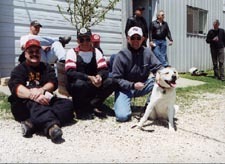 At the Iowa rally I was directed to Bob (Ned's Auto & Cycle, Riverside, Iowa). Whadda guy Bob is! With a huge smile on his face Bob said he'd fix me up with that same tank bag. Ned's also has available a great looking touring seat for the EV. If you're considering replacing your EV's seat, I think this one is another "long distance in comfort" seat. Supposedly this bag is 40 liters. In the picture you can't see the additional 3-4 inches that expand upward from the top. It's so high I can't see the speedo and tach if I fill the bag completely. Maybe I like gizmos, but to me all of these things I've added to the bike are useful and I wouldn't want to do without them. An example is: the Trek bicycle speedo. It is accurate! It can be calibrated to your own motorcycle's wheel size. This tiny thing has a speedo, clock, does average speed for a trip, has trip meter, which I use for tank to tank stops, and it tells you the highest speed of your local ride or trip (in case you were afraid to look at the time when you squeezed between the Buick and 18-wheeler). Fifty-five bucks at a bicycle shop. Of course, it's water proof. I love it! Three or four months back Greg Field had a tip on my cheapo throttle helper. It looks a little rube-goldbergist but boy does it work well, and is it cheap to buy! Greg said it was kinda a wingnut thing, but it saves my throttle hand on those rides of 16 hours or more. The thing is, I don't use my EV for "cruising." When I get on my EV, I go. And I go fast, and I go far. "This ain't no cruiser!" To go fast and far you need to be able to carry enough fuel. The original gas tank looks great. In fact I have loved the looks of all of the California models over the last ten years or so. The California III gas tank holds 6.6 U.S. gallons. But because of an improved air filter system for the EV, the factory removed some of the tank's capacity from underneath. That left 4.8 U.S. gallons. I ran out once. (Ken Hand runs out once every trip! Ha!) After my riding partner (Chuck Oborny) pulled me and the EV to a gas station, I was able to put only 4.7 gallons in the tank. I filled it full, too, until I could touch the gas with the end of my stubby nose. If the EV got 50 miles to the gallon, all would be well. However, depending on how cold it is or how fast we go, my EV gets from 30 mpg to 42 mpg. If the temperature is 75 degrees (F) or higher, running at 70 mph, it'll likely get close to 40 mpg, if there isn't a head wind. Pulling the trailer will cause the EV to use more gas. Unfortunately Chuck doesn't ride that slow! Rain and cold doesn't wipe the smile off his face either. I'll say something like, "It's supposed to be real cold tomorrow morning when we leave here in the dark." Chuck's answer to that is, "We have our AeroStich suits!" Finally, what I'm getting at is that I had an itch for a larger supply of fuel. One of the things I whined about was the little gas tank. Low and behold I saw my dream come true last year when I attended the MGNOC National in New Mexico. Jim Knaup of Encore Performance Cycles, Prescott, New Mexico, had worked a deal with a local genius in Prescott who built a custom tank. It's very close to being three gallons larger than the original tank. I offered to kill whomever he'd wish if he'd just sell me this tank. He stated it had been waiting for me all along! After mortgaging our only daughter I was able to obtain this "wonderful thing." Later, I decided to have it painted. A local guy did the job for me. I was amazed at the quality of work for a really reasonable price. Jeff Perez was easy to work with and talk to. He completed the job promptly, striped the tank and placed the Guzzi decals exactly the way I wanted. I don't know how he could have pleased me more! Thanks, Jeff! Unfortunately I'm short. Of course I blame this on my mother - she's 4'10". However she claims I got my good looks from her as well, so I guess it's a trade-off. Anyway - for years I've been trying to reach the ground on my Guzzis. It ain't easy holding up Mary Jo, the 600 pound Guzzi with junk stuffed into two huge (wonderful) bags on that REAL luggage rack, and then have a trailer hanging on! I had simply had enough! So, not listening to good advice, I bought a pair of rear shocks to replace the original WP units. And I really didn't want to do that! The original rear shocks on my EV are simply better than anything I've ever owned. But they had to go. The new shocks came from Progressive, and they lowered the rear end by one full inch. I'd already lowered the front end by sliding each fork tube up 15/16 of an inch. But I wanted it lower yet, so I began a search for a low profile tire. The size I wanted was a 140/70-17 to replace the 140/80-17. I couldn't find anything in a "touring" tire. I even tried a pair of radial tires. I thought these would do the job. I mounted a pair of Avon Azaro radials on the EV. At 60 mph the bike felt strange, but at 80 is was death-defying! I mean it was literally all over the road-felt as if the frame had a giant hinge in the middle. Shortly after I mounted these tires on the bike a member and friend called me to say he had put the very same tires on his EV. He experienced the same "die young" feeling! 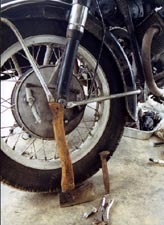 I had previously tried using a Bridgestone Battlax BT45 on the rear. It was the size I wanted, the price was reasonable, and I thought if I could get 5000 miles out of it another dream had come true. (The previous "tall" tire was good for 12,000 to 14,000 miles.) The Battlax wore quickly, and after only 2700 miles it was nearly bald. So I've been running the shorter rear shocks and lower profile tires for about 10,000 miles. So far nothing bad has happened. The U-joint seems okay and the rear-end hasn't ground itself to death from the lack of oil (knock, knock). I am 5'6" and now can put both feet flat on the ground with a slight bend in the knees. Lots better than tippy-toes, I wanna tell you! 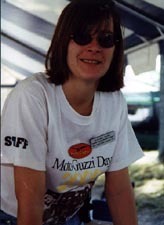 So far this year I've attended three Guzzi activities. 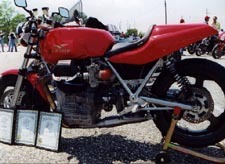 The first one was sponsored by Moto Guzzi North America (MGNA) in Angier, North Carolina. Angier is the headquarters for MGNA. I left here early on Friday morning. I made motel reservations in Knoxville, Tennessee for that evening. The weather conditions were great and I had a good ride of 1000 miles that first day. As I pulled up to the motel I noticed a red LeMans. Come to find out Mac Caruso had a room at the same motel. Neither one of us knew the other one would be there. We've known each other for several years, so this was a nice surprise. We had supper together and then each of us turned in early. I assume Mac went straight to his room: I know I was ready to hit the hay. I left early the next morning, and after experiencing heavy fog the blue sky started to show through. A few hours later I found the motel that MGNA listed in the March 2000 newsletter. Great motel room, and considering today's rates the price was reasonable. The employees there were a treat too. 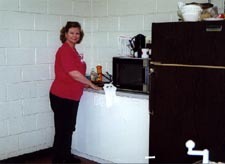 This motel was the Comfort Inn in Fuquay-Varina, North Carolina. Considering the many motels I've stayed in over the years, I'd vote this "one of the best all around" motels. By afternoon many Guzzi people were there. Lots of motorcycles. This was a great time to talk to old friends and take some photos. 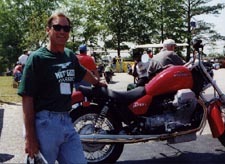 John Porter (Guzzi's head guy in the United States) was there and so was the famous Dr. John Wittner. Both gave a short speech that proved interesting. They also provided information on Guzzi's future and the tantalizing info about Aprilia's buy-out of Guzzi. 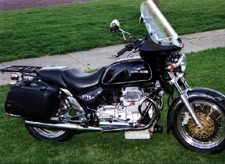 I was already upbeat about this deal and I felt it was a good thing for Guzzi, but after listening to John Porter and John Wittner I felt even more enthusiastic about the buy-out. The two hour dinner and information was interesting, educational and worth the ride from Kansas. Maybe the most impressive thing I saw at the rally was John Porter in line for his noon meal. 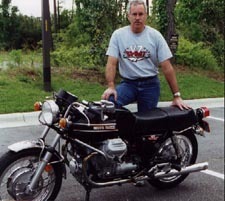 John is the "Big Guzzi Guy" in America. This was his deal but he stood in line with the rest of us. In fact, he was way back there. Taking your turn even though you run the show definitely shows good character. Of course I was way ahead of John Porter. No, I wasn't in my usual first place in line. A couple that rode Kawasakis beat me there. I was third in the food line though. But the best was yet to come. The next morning I rode the 6-8 miles from the motel to Angier. Angier is bigger than I expected. Lots of businesses; unlike what we have in Kansas for a town of its size. Nice. The general layout of MGNA's headquarters is impressive. There's a huge parking lot, attractive building and a great atmosphere. The people attending the open house (Guzzi Day 2000) basically had the run of the place. The MGNA employees were extra friendly. I mean that! The employees went out of their way to make things happen. I'm looking forward receiving my free professional photo from MGNA. We drove our bikes (one at a time) into the building and had a photo against a background of a huge wall photo of Carlo Guzzi and Guzzi's first racing team. After the awards were given out and after the RED Jackal was given away, I was gone. MGNOC member and new friend (Steve Huber) and I blasted out of Angier. Steve led the way on his SP1000. Approximately 250 miles later I dropped off at Asheville, North Carolina and Steve continued on to his home near Knoxville. It was a fast ride. Thanks again, Steve, for leading the way. About two weeks later Chuck Oborny on his CAIIIi, Richard Roth on his 1100 California and yours truly on the EV (all from Larned, Kansas) headed out at 6:00 A.M. to attend Harper's Moto Guzzi Open House, some 300 miles from Larned. We had looked forward to this for sometime. The weather was good to us except it was a bit cool when we left at 6:00 A.M., and it was extremely windy on the trip home, but of course, this is Kansas! We arrived at 11:30 A.M. and left for home at 2:00 P.M. sharp. Good seeing our friends and eating free food. Harper's location is unusual for a Guzzi shop, but it's always a pleasure to be there and see their long list of old Guzzis and old British bikes, not to mention all the other machines they have. I love the location and the shop is really more like a museum. They also allowed free demo rides on the V11 Sport, Jackal and Quota provided by MGNA. Among my friends I count Steve Lingg. Steve is now our state rep in Nebraska. (Steve Lingg is pictured below.) Steve's grandfather was a member back in the 70s. 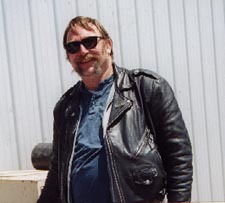 Warren Lingg helped me a lot when I started producing the newsletters. In fact Warren printed the newsletters for a few years before he retired. Grandson Steve has been a MGNOC member for a very long time, so it's certainly appropriate for Steve to head up the state of Nebraska. 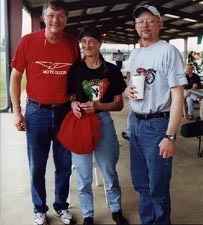 My most recent ride was to the annual Louisiana Moto Guzzi Rally on May 19, 20 and 21. Great rally - Mary Jo, Caress (the Yellow Lab) and I enjoyed it. I'll leave the report to William and Yvonne. Chuck Oborny, Mary Jo and I, along with our dog Caress, left at 6:00 A.M. on Thursday morning. We opted for an easy ride to Tyler, Texas where we spent the night after a 600 mile ride. From there we traveled only 150 miles to the rally. Both bikes (Chuck's CAIIIi and my EV) preformed well with no problems. When we left Tyler on Friday morning to go to the rally - information on the weather channel indicated a gloomy, rainy picture, but as it turned out the rain was light and only got the bikes dirty. By the time we arrived at the rally the rain had already stopped. The remainder of that day was nice. In fact, the weather prediction indicated that was the end of the rain, and Saturday and Sunday would be fair, but it did rain Friday night. However all campers were in their tents, and some tents were under the wooden sheds, so that rain didn't really bother. Saturday was perfect - beautiful and warm. Had a good ride home the following Sunday. Watching the weather forecasters (again) on Sunday morning, the weather channel was predicting rain in Tyler. In fact it was raining in Tyler (they said) and moving in our direction. They also said it would rain in all of the parts of Texas and Oklahoma that we were going to be riding through. I mean it was written in stone! Chuck said something to the effect: "Maybe we'll slide through somehow without getting wet." I said: "There's no way - rain is predicted throughout our route!" We never felt a drop! Why were we not surprised!? Those weather predictors were completely wrong! About 100 miles into the ride the fog cleared off and the sun came out and we never saw a cloud until we were about 80 miles from home, and those were only a few puffy white ones. Exactly (odometer corrected) 1675 miles altogether. We put on about 200 miles riding back and forth to the motel. Unfortunately the local motel (Days Inn) lost our motel reservations, so we got another motel 22 miles away. We took a different route home, and from the motel it was 705 miles. We did that in about 11 hours. That figures out to be 64 mph average. Despite the false weather report of thunderstorms for the weekend, the turnout set a record. Had the weatherman kept his mouth shut I expect there would have been a much higher attendance. On the trip to the Louisiana rally the EV got about 34-35 mpg pulling a heavy load and running around 65-75 mph with favorable winds. Pretty good load too: riding two-up, with two big bags full on the REAL luggage rack and pulling a 200-plus pound trailer. Going home and pushing a 15 mph headwind wind and running FAST with the 200 pound trailer in tow (Chuck was in the lead and ran like a racehorse heading for the barn), the EV got only 30 mpg. All in all it was an excellent trip and I'm already counting the days until the Kansas rally (one of my two or three favorite rallies). After just a little over two years of owning the '98 EV, it now has 36,000 miles on the clock. I can honestly say I'm extremely happy with it.